One of the most common hesitations of real estate brokers when it comes to hiring virtual assistants is communication. This is a valid concern. I understand it because when I started working with clients globally, there were also many questions in my mind. What if we weren’t able to work it out? What if we have different styles? Is this opportunity really worth it? Hiring someone could really be difficult at first because there is a high chance that you will be working at different time zones or locations. It’s even hard to say what you have in mind to your virtual assistant because there might be misunderstandings, plus, the reality that he or she might not immediately read or answer your messages and calls. Those are a lot of valid concerns but don’t fret. These scenarios can be avoided when two people are dedicated and willing to work hand in hand. Screening your VA though is quite hard because you have to look beyond what they say they could offer — they could always say that they help you with “everything”. The real challenge is how you are going to know who fits in your business? How to make sure that someone can be relied on? There are times when you need to point out things you don’t want to be done by your hired VA or times when you need to highlight issues that need to be resolved right away especially when an unexpected problem arises during the contract. Communication is key. This is where you need to assess the tools you are using if they’re working effectively to your advantage. If all is well in the manner your VA responds to you, then the problem might be on the communication tools that you are using. If it’s not working, it’s best to stop and look for something better. Asana – A great project management tool for real-time collaboration. It has a lot of customisation available for creating and streamlining processes. It also helps users to keep track of their activities and break up projects into smaller, actionable tasks. If you love to work on lists and have a lot of moving pieces in your process, Asana is perfect for you. Trello – This is a task management tool that gives you a visual overview of what is being worked on and who is working on it. It uses boards, lists, and cards to create a simpler visual system of project management. Perfect for doing braindump, storyboards, and other planning activities that require more visualisations. Skype – One of the telecommunications application software product available out there that specializes in providing video chat and voice calls between computers, tablets, mobile devices. Even when you’re using Skype on a computer, you can still contact someone via their mobile or landline number. Voxer – If you’re not a text or typing kind of person, Voxer is for you. It is a Walkie Talkie messaging app for your smartphone allowing you to share live voice messages, text, photo. Aside from communication tools, one of the many reasons that can strain your relationship with a virtual assistant or any contractor is payment. When it comes to sending payment, there are a lot of ways on how you can send money securely and on time. TransferWise – It’s an online money transfer service that uses a smart new approach to allow people to send and receive money safely from abroad without the high fees added by most high-street banks. TransferWise lets you transfer money up to 8x more cheaply than with a bank. They receive the transfer and do the exchange currencies in a transparent way — allowing you to refer to their website to see exactly what the exchange rates are. Payoneer – Another financial service company that provides online money transfer and digital payment services. Account holders can send and receive funds into their bank account, Payoneer e-wallet, or onto a re-loadable prepaid MasterCard debit card that can be used online or at any point-of-sale. PayPal – The most common payment gateway is PayPal. Your hired VA can you send their own https://www.paypal.me/ link with the agreed amount or you can enter the amount you want to pay. As long as you sign up for your own PayPal account, you can also use it to pay for your other online purchases. 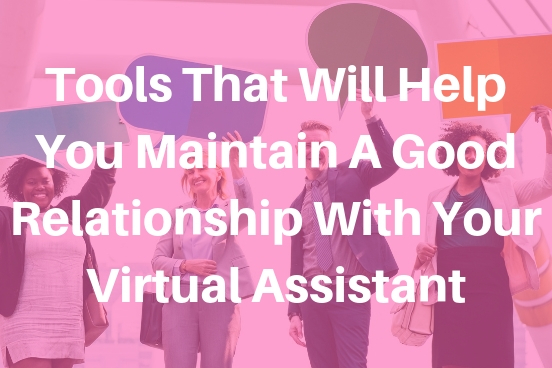 Now that you are equipped with the communication tools and payment options to keep a good relationship with your virtual assistant, it’s time to get some work done. Need help how to set this up on your end before hiring? Let’s talk about it. Book a call with me click here.